When I moved into my new house (old, but new to me) 5 months ago, I decided not to paint the kitchen cabinets. My house was a Parade of Homes house back in the 80s and had a lot of oak built-ins. 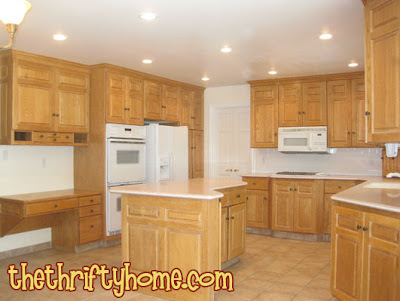 Every cabinet in the house is the exact same honey oak cabinet and there are a LOT of them. After 5 months I just got tired of seeing honey oak in every room and finally decided to do something about it. They are really great well built cabinets so replacing them is not necessary. I just need some of them to look a little different and not so matchy-matchy. After 3 days of solid work with DH taking 2 days off work, we still haven't finished priming everything. We are also doing the built-in bookcases in the great room and the entertainment center so there are a LOT of doors. It took about 3 hours just to take them all off the hinges. 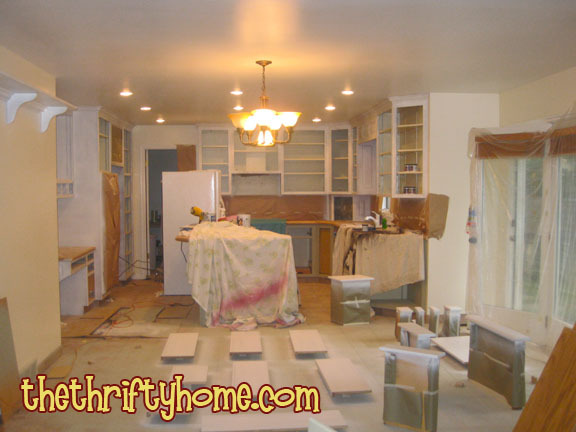 The bottom cabinets are going to be a darker color and the top cabinets will be a lighter almost white color. I haven't chosen the exact colors yet, but know that I want at least 2 different colors to break up the monotony of all the identical cabinets including the built-in entertainment center. The entertainment center is a whole project itself. It was built in the 80's and needed to be sawed up a bit and re-arranged to accommodate our large flat screen TV (pictures to come soon). You can save extra money for a kitchen remodel with a VA refinance. Wow! You aren't kidding, that is a lot of honey oak! Excited to see what you decide to do! Looking forward to seeing the end result of your project here.